Frances McDormand caused some chatter in October when she told Frank Bruni in the New York Times that she thinks “looking old . . . should be a boast about experiences accrued and insights acquired, a triumphant signal ‘that you are someone who, beneath that white hair, has a card catalog of valuable information.’” In her gorgeous turn as the title character in HBO’s four-part miniseries, Olive Kitteridge, McDormand uses her 57-year-old expressive face to glorious advantage, registering with her eyes and mouth and the turn of a head all the complex emotions that move across this unhappy, reproving, unyielding woman’s countenance. Director Lisa Cholodenko and screenwriter Jane Anderson adapted Elizabeth Strout’s Pulitzer Prize-winning novel, which I haven’t yet read, into this searing inquiry into the sad nuances of emotionally constrained and shuttered lives. Olive and her long-suffering, sweet husband, Henry, played with warm, hapless vulnerability by the wonderful Richard Jenkins, have lived in an unremarkable small town in Maine all their lives. He’s the local pharmacist, who runs the Main Street drugstore until he sells it to the “Aid-Rite” chain. He knows everyone and dispenses kindly over-the-counter advice along with the pills he diligently counts out. Olive teaches middle school math, subjecting generations of local children to her exacting standards and ruthless assessments. 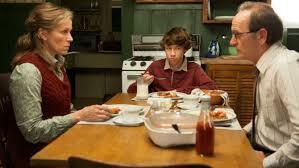 Their poor only son, Christopher (John Gallagher, Jr. as an adult and Devin Druid at 13-years-old), doesn’t stand a chance as the other point on the triangle between his parents. In his later years, he spends a lot of time in therapy, trying to shore up his battered ego. 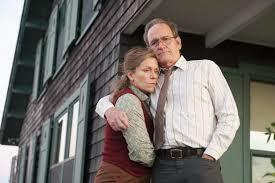 The miniseries covers decades in the Kitteridge family’s lives, with each of its four chapters jumping in time and requiring McDormand and Jenkins to perform increasing frailties with thickening middles and wrinkling, spotted faces. But more than an inquiry into aging—though it is that, too—Olive Kitteridge is a character study of a woman who fashions herself in a fire of her own making, not just as defense against a tragic past but as determination for blazing through an unknowable future. We don’t know much about Olive. Her father committed suicide, a violent act by which she’s clearly haunted, though she refers to it only obliquely. When Kevin (Cory Michael Smith), a local boy who had a troubled mother, returns to Maine as an adult with his own psychological baggage, Olive dissuades him from suicide. She describes the aftermath, which she’s clearly seen firsthand, in a way that shames Kevin out of his plan. Olive and Kevin happen to witness Patty (Rachel Brosnahan, luminous in a tiny role), a local waitress, literally blown off a cliff in a strong wind. Kevin jumps into the churning water below to save her, jump-starting his own second chance for life. The miniseries, in fact, argues most often for second chances, suggesting that people are resilient enough to prevail in the face of what comes at them, unexpectedly, from all sides. Some characters, though, in this panoply of emotional damage, simply succumb to the miasma of mental instability and sorrow that infuses their lives, which Cholodenko depicts with vivid imagery and effective empathy. The story opens in the present, with an elderly Olive walking through the woods, laying a blanket over the leaves not for a picnic, but on which to lay a revolver that she carefully loads and prepares. She turns her radio to a classical station, leaves an envelope addressed “To Whom it May Concern” beside her house keys, and looks up at the sky and the barren but strangely beautiful trees, resolute. Part One then flashes back a few decades; Part Four returns to that prophetic moment. In between, Olive’s story unfolds. Cholodenko and her cinematographer, Frederick Elmes, make the most of the New England setting (shot in Massachusetts, though the story is set in Maine), evoking the details not just of small-town northeast life but of a couple who’ve lived together in the same modest house over their long, complicated marriage. Olive rigorously tends her flower garden, which looks out over an expansive bay. The scenery, though, always seems rugged and just a bit foreboding, rather than evoking a more comforting, soulful beauty. Cholodenko and screenwriter Anderson pace the story in a stately manner (sometimes, the mournful score underlines the film’s tone and tempo too emphatically), moving it inexorably forward by a few weeks or months or years, while marking how little really changes. Humor infuses the narrative at odd but appropriate moments. Some of the subsidiary characters are played for laughs; there’s Angela (Martha Wainwright), a piano-playing lounge singer who’s crooning Top 40 favorites every time Olive and Henry go out to a local restaurant. She also appears later, entertaining the residents of a nursing home. Angela’s second-rate performing seems to be another mark of small town life. But although her ubiquity is funny, it also feels a bit cheap. As FS2 observed, it’s shtick in a different register from the rest of the film. Olive and Henry couldn’t be more different—she the obdurate realist who can barely stand to be touched, he the sappy romantic who can’t help but love her anyway. McDormand and Jenkins beautifully enact the complexities of loving another person as they age, marking each of moment of witting or inadvertent wounding, each flash of reluctant but deep love and admiration. The characters who round out their journey are deftly drawn and indelibly played. Zoe Kazan, as Denise—a lively young thing who comes to work in Henry’s pharmacy and draws his affections—captures the pathos and complexity of a character who could be rendered a two-dimensional stereotype of empty femininity. John Gallagher, Jr., as the adult Christopher, nicely plays the frustration of a man whose emotional life has been shaped by the push and pull of parents who either love him too much or not at all. Bill Murray, in a small but key role, is perfectly cast as Jack, a crusty old man with an outlook and affect that matches Olive’s. 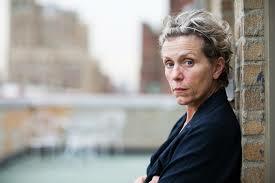 But it’s McDormand who makes Olive Kitteridge must-watch TV. She’s fearless and feminist as a woman who could care less whether she’s beloved or despised, who sets her own moral compass, buries her wayward desires, and looks only forward, even as the past pulls at her and shapes her. When, near the end of the story, Olive hears Rush Limbaugh’s voice on a car radio, she lambastes his destructive stupidity, explicitly aligning herself with feminism, against racism, and for the worthiness of queer lives. It turns out that her world has been larger and more engaged than she’s let on, an exemplar for steely self-worth that refuses to suffer fools gladly. 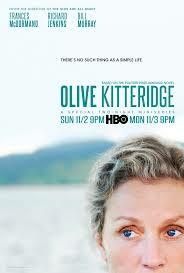 Olive Kitteridge is an austere, sad story, uncompromising about the sacrifices and compromises long relationships require and about how we’re forged by family intimacies we don’t exactly choose. Watch it to admire the direction, the story, the character, and McDormand’s own resolve, which mirrors her role so thoroughly (she executive produced the project). We need more women in theatre and film like Frances McDormand, who resist the hegemony of youth culture and value what it means to age as a woman.